every year around this time, I sit at the little wooden desk by the window in the front room and I watch. I wait for the little explosions, for the tiny green buds on the two trees in the front yard to break open and scream pink. every year, I watch and I wait. and every year, when it finally happens, it reminds me. of that time we said yes, that time we closed our eyes and leaped into that place they call the unknown. or, in our case, the great pacific northwest. pink blooms remind me that we were brave once. they ceremoniously mark another year here for us in the city of portland, oregon. I think about the first time we drove down our street. a knotty-headed two year-old ezra, a wide-eyed six year-old ava, a bewildered seventeen year-old cat and a thoroughly exhausted 36 year-old me and 38 year-old ward. we'd just finished driving across the country. seven days, eleven states. georgia into tennessee into kentucky into illinois into missouri into kansas into colorado into wyoming into utah into idaho. and then finally, oregon. oregon with its green green green everything everywhere, its commanding, unforgiving winds and magnificent vistas, its chartreuse moss quietly covering every surface in sight. and then we were driving across a bridge (who remembers which one) into a brand new city and then we were driving down our street for the very first time, beyond exhaustion but also wild with excitement and above all else, wildly hopeful. when we pulled up to our house for the first time, all we could see were the pink blooms and a spectacular mess of pink confetti on the front sidewalk. the trees have thrown us a little party, I thought. it's got to be a sign. seven years later, here we are, exploding pink trees and all. when things started to bloom last week, all the old feelings came back again, just like they always do. I walked outside, camera in hand, just like I always do, tried (in vain) to shoot the exploding trees in a way that would tell the story, just like I always do. every year, I try. I always try. 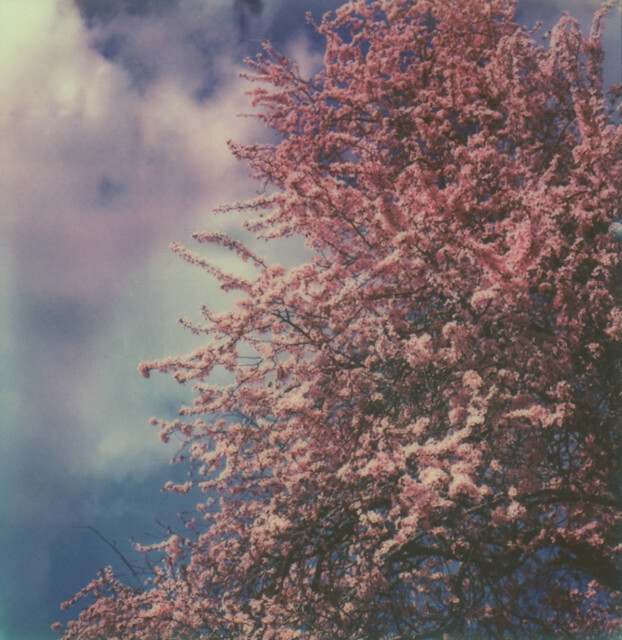 I pointed my SX-70 at those little pink guys and hoped for the best. last shot of the pack, last few days of the blooms. and the last time I will sit at the little wooden desk at the window in the front room of this house and wait, the last time I will watch the two trees in this front yard turn bubblegum pink, the last time I will point my camera up towards those bloom-covered branches. because in a few short months, we'll be making our way back home. we'll be moving back to atlanta, georgia. there's a longer story, of course, but the short of it is that we miss family. we're tired of living so far from the people we love. we love portland, but we love our people more. that's what it comes down to, I guess. we're choosing the family we love over the city we love. is there any other way? any other choice? for us, there is not. most days, I vacillate between weepy and giddy-- weepy for everything and everyone we're leaving behind, giddy for the mountain of good that waits for us on the other side. I am a tangled, knotty mess of emotions. and I am currently up to my eyeballs in purging and packing, in list making and problem solving. I am swimming in change, paddling fast, struggling to keep my head above water. I can see the other side but just barely. there are still so many miles to go, so many miles. I find myself wishing the time away, begging for something like a giant fast forward button. and then I panic when I realize what that would actually mean. when we've finished with the move and we begin the big road trip home, this part of life will officially be over. portland, as we know it, will be over. a thing we will talk about, past tense. and I cannot imagine it. I want it to be over but I never want it to end. does that make any sense? probably not. but that's the sentence I find myself repeating over and over. I want it to be over but I never want it to end. in the meantime, petals are falling. little papery bits of pink are beginning to carpet the front sidewalk. soon, the ground will be covered and I'll take my shoes off. I'll walk barefoot through the confetti, just like I always do. I will stand in it one last time. and I will remember that time we said yes, that time we jumped, that time we were brave. there is a sadness that precedes a brave decision. but there is also joy and anticipation. your sitting with both of them. everything you shared makes total sense. wishing you an easy transition. You've just described every single move (and there have been so many) we've done since getting married and committing to an Air Force career... I totally understand. I've been reading your blog since before you moved to Portland, and was a little jealous that Atlanta was losing some really neat people. Now I feel kinda bad for Portland (but glad you'll be back in ATL.) I'm excited to see the creativity you guys bring back (and hope for some great photography projects). Welcome back! This is really beautiful writing that gets at something very raw and real to me. Thank you. you are brave. all the best. I think sometimes brave is choosing to go back from whence you came. We made a similar leap 3.5 years ago to be back near family. There are moments I really miss the mountains in New England, but I always missed our family a whole lot more. Good luck with everything and hope the move and transition goes as smoothly as it can! Well, I've just been waiting for this day! I am so sad you are leaving Portland, but SO glad we will just be a few hours away...and you will always have a good reason to come visit Nashville! It's always so bittersweet to leave what you've come to call home, but I'm thankful that you will be coming towards sweet people who love you...and I for one, cannot WAIT to have the Jenkins a little closer! Tell Ava she needs to start planning a girls weekend ASAP! I always knew you would go back one day, but now that the time has come I feel a significant ache in my gut to see you go. I will forever be grateful for the time, however too few and far between, that we got to really connect. You 4 are a super special crew. I love you. Oh, congratulations, Andrea! I have been reading your blog for so long now. I can't believe the big move was seven years ago! Happy returns to you and your family. Enjoy the hot sun and the fireflies. Wow. I feel you. Totally understand why you're doing what you're doing, and understand how hard it will be to leave this awesome place. Love you to and the family. i imagine it will be hard to leave portland (i practically associate the city with you). but lucky atlanta, lucky loved ones and lucky me (you are closer!). i anticipate your farewell photos and posts to be exquisite because you just capture the love and authenticity of place like no one else. Oh, this city will miss your lovely eye...blessings on your new brave journey. "I want it to be over but I never want it to end" - I can totally relate A. We are making a longer transition from P.Town to Southern Cali but I have lived in the Portland area for 28 years so it is really hard for me to let go, esp. when I am going to be leaving a couple of my "kids" in P.Town. But I also miss living in London and England so my family is scattered EVERYWHERE. this is so beautiful. we will be moving extremely far away soon, and i can imagine that this is going to be exactly how i feel. and years later, how i feel too. Man, I love this and hope good things for you all amidst the aches of change. After living six years in Seattle, my hubby and I moved back to his hometown, Nashville. Bittersweet, but mostly sweet. Thx for your post! You link us all together with your musings! Beautiful and heartfelt! I wish you all the best on your next adventure. This move is brave too, brave and full of heart. It's always hard to leave a home and sense of belonging in a place, especially one that has held so many special times, but this sounds like the right thing.